We were curious how our Zubuchon chicharon compared with our competition, so one day we bought samples of 9 or 10 other brands of chicharon for sale in the domestic departure lounge of the Mactan airport and did a taste test, as well as comparing prices, packaging, weight, etc. It would seem ungentlemanly to rate each one of these producers individually, as we are retailers of chicharon ourselves, so I won’t be that specific. Instead, I would like to make some general comments on the product and provide tips for consumers so that they can make more informed buying decisions in future. I realize it is completely a personal preference, but ahh, my readers are true to my heart, with roughly 75-77% of you prefering chicharon with LAMAN and not just the airy light all-skin versions so frequently available these days. If you are going to ramp up your cholesterol levels, you might as well do it with a product that has character, verve and purpose — that is chicharon with LAMAN. Otherwise, I would send you to the grocery aisles with all those mysteriously puffed up and flavored foil packets concoctions that miraculously retail for less than PHP10 a packet. Hocus pocus, artificial flavorings, space-age puffing and frying equipment, carbs and fat is great sometimes (I have to admit a weakness for Chippy since childhood), but chicharon is one of the oldest and most honest of junk foods. :) All-skin or the lighter airier chicharons are cheaper to produce. They require less labor, less time cooking, less rendering of fat, and less energy to fry them. They have greater volume for their weight. Surprisingly, at the Cebu airport, roughly 50% of all chicharons on offer are of this type, even though it seems 3 out of 4 people seem to prefer the chicharons with laman. Traditional Carcar chicharon, for which Cebu is quite well known, has laman — and this style should be and is more expensive by weight. It seemed odd to me that several packages contained weights like 60, 70, 90 grams instead of a nice round number like 100 or 200 grams. The first thing we did was to actually weigh each package of chicharon, and duplicate samples of each brand when available. Some slight variances in actual weight vs. published weight is normal and expected, particularly since many of these packages are hand packed and thus some will be up to 5% below or above the published weight. Roughly 60-70% of the packages tested were close to, or at, the published weights. None were noticeably heavier than published weights. But 30%+ of the packages were up to 15% underweight, which is not nice at all. We would have to buy a dozen of each of those brands to determine if the lesser weight is chronic, or intentional, or just an aberration. Best I could guess, there are two things at play here… the odd weights are to make price comparisons between bags a little bit more difficult for consumers. Hence, unless you are a walking calculator, it’s hard to tell if a 40 gram package for PHP35 is a better or worse deal than PHP60 for a 70 gram package of chicharon (the later is cheaper by PHP18 per kilogram worth. Add on the possibility of underweight contents, and the price comparison becomes downright confusing. Do not be deceived by fancy packaging… there appeared to be little correlation between packaging and quality of product. More likely, nice packaging resulted in higher prices. I can appreciate the effort and investment in packaging, but this should sway you little in your search for the best and the best value chicharon. Expiry dates range from about 15 days to 3 months! Ideally, it’s best to buy chicharon that has been freshly cooked and packed. At Zubuchon, we cook chicharon 6 times a week, in relatively small batches. It is a pain in the neck, but it ensures that we almost always have fresh stocks. It also means that for the airport, we replenish daily, and often twice daily. And the chances of your buying chicharon cooked within the last 24 hours is fairly high. At our restaurants, the chances are you are buying chicharon cooked within the last 1-3 days. Our packs are generally labeled with expiry dates of 15 days after the chicharon was cooked. It can last another week or two after that, but we don’t recommend it. I believe we had the shortest published expiry dates of all packs tried. We did notice several other brands with one month, two month and even three month expiry dates. Personally, I think 2-3 months is simply way too long and unless they are using preservatives, special packing that removes air from the package, etc., you are likely to detect an increasing level of rancidity in your chicharon. It probably won’t harm you, but it won’t be the best tasting chicharon, either. Of the several packs we tried, at least 30% were noticeably to ridiculously rancid. Try to stick to products that were cooked within the last 5-10 days or LESS when you consume the product. I do like those stalls that sell freshly cooked chicharon, but most of them do the airy skin only (and often with re-used vegetable oil rather than lard) versions and I prefer chicharon with laman. Don’t buy chicharon and let it sit in your pantry for another month or so. I have never frozen chicharon, but that’s worth a try I suppose — I just threw a pack into deep freeze for a couple of weeks to see if that yields reasonable preservation of taste and crunchiness. I would only buy Zubuchon! Thank you Market Man, you are an honest, true and fair businessman. Good to know Zubuchon chicharon is not “tanga”, otherwise MM would have a fit :)….Papa Ethan, that’s just so funny! how would you rate or compare lapid’s chicharon available in metro manila? ….. whenever my sister-in-law from bohol would come to manila, i would always request for that famous chicharon in bohol–with laman. one packet cost 100 pesos only when you buy it from the mall. i used to make my own chitcharon, rind with a bit of laman. i tried dehydrating and tenderizing them at the same time and they turned out really good … light, and puffy, like popcorn. the problem was, they take the longest of time to make! i do them in big batches, just using salt for flavoring. after a time, i opted to stop making them. health issues were bound to arise, specially if served almost with every meal … my short-cut version would be the “fitichan” … diced/cubed and salted back-fat (no rind) toasted in it’s own lard. so crunchy! the chitcharon-bulaklak i make almost always with the fitichan and the rind. i have yet to try making your “tampalen”. hi marketman you should try the chicharon manufactured in tanza, cavite the brand is pat and kat. it is greaseless so good. Chicharon Carcar Style — great photos from a trip to a large manufacturer in Carcar. chicharon and atchara , perfect combination with hot rice!!!!!!! you’re making me hungry..
DOST has a packaging center that helps small entrepreneurs improve their food packaging to extend shelf life. Plastic is actually porous and allows a small amount of air in over time, which will degrade food products. The metalized packs, seen in Frito Lay and Jack & Jill products are impermeable and the air inside is replaced with nitrogen, which doesn’t oxidize food. The DOST center can even test the shelf life of your product given the different types of packaging. Pili nuts have a type of oil that easily goes rancid, but foil packing has extended it’s shelf life enough that it can be exported. I missed all this pilipino comfort foods that you feature in your foodblog.I have to blame you bec. now im contemplating of… retiring in the Philippines We have a request (being an expat for 24 years) .Can you give your opinion & suggestion as to where is the best & safe place to live in around Metro manila and how much it cost to retire and have a decent lifestyle in the Philippines. Thank you ! marketman this will assist a lot of pilipinos living abroad. May I suggest that you check out the area of Sta. Rosa, Laguna. It is being developed by Ayala Land Corporation and they have set up good subdivisions in the area. I live in one now. There are schools, commercial complex, it is near Tagaytay and Alabang,(30 mins away). The air is clean. It is suburban living at its finest. 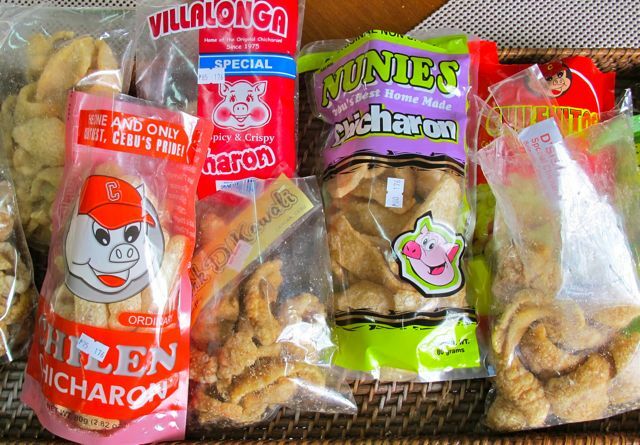 If you have the chance, try the chicharon made in Carcar, Cebu. It’s their specialty product and quite good. I have been in Carcar many times and indulged in a lot of the local chicharon. my dad used to say when you buy the “airy” chicharon, you’re paying for exactly that – air. this post is making me crave for chicharon for breakfast. Chicharron (is it not 2 rrrrolled R’s? that is what I was taught by a Mexican friend) is a very occasional treat that we get from an Eastern European butcher who makes both pork and goose cracklings. The latter is especially delicious, we prefer it to pork actually. I love chicharon – my favorite one is Carcar chicharon with laman! Thanks for the thorough study and comparison, MM! However, strange not to include a section on “Taste” when comparing food items. I really want to become part of the Marketmanila Research Team. I have this certain feeling when I read Lapid’s and Walang Laman. lee, my thoughts exactly, hahaha! And we’re not talking of chicharon. Your chicharon looks like the kind my dad’s makes in California. They use lard, no additives. Crunchy w/ a little laman. Perfect for sinegang and munggo! In my circle of friends though, we have a running joke: “LAPID’S” should change the “S” in their brand name to “A” because the more frequent you buy their product, the closer you are to investing in your own “LAPIDA” (- lapida means gravestone, for our non-Filipino friends -). If I’m going to have chicharon, might as well go the whole hog and have the laman! Am sobbing for being soooo far from chicharon (tanga or with laman), and reading about salt and vinegar chicharon (that sounds divine) and the vinegar/bagoong dip. Crispy roast pork is available here but it’s nothing close to a bag of chicharon, suka with sili. I’ve seen powdered vinegar in PureGold Subic, in the Japanese goods section. I don’t know if it’s a regular product though and may be a one time thing. Maybe the Japanese groceries carry it. Gerry, it’s actually a dehydrated form of acid, I think. You can make your own by reducing vinegar with some additives, but I haven’t tried… thanks for that. MM, the Zubuchon chicharon is comparable to this superior chicharitos I tasted in Portugal. My husband, who travels a lot, looks for chicharon (or a country’s version of it) wherever he finds himself. He said his favorite is the one from Portugal. He tried the one from Zubuchon in December and he changed his mind. Seriously. MP…if you can get pork skin where you are, try the chicharon recipe I shared before…just don’t know where it is posted. I made some chicharon and shared them with La Emperor and friends plus nephews. I always make them with a bit of laman just like the Zubuchon chicharon. Your hubby need not wait till he travels again! Send me an e-mail if you cannot find it and I will send you a very detailed recipe of the chicharon. This may not be seriously way out of line while we are on the topic of knowing what we eat, but I thought the link below is worth considering, seriously……. Hi Bettyq, before I read your comment, I decided to start going through MM’s archives and make separate files for his recipes, yours and sister’s! This year is my year of experimentation as hubby will be transferred to another post where pork and other hard-to-find-in-Jordan ingredients are abundant! So yes, I will try to impress my hubby and his new colleagues with dishes whose recipes were culled from MM and his followers. My success with the home made lobster oil made me realize that there’s hope for this mediocre (at best, for now) cook! I am so excited at the prospect of not feeling guilty that my nice linen and fancy china are wasted on so-so food hahaha. So yes, I will look up your chicharon recipe (and the rest). Maraming salamat talaga! There is Pork Chitcharon Microwavable from Davao. You will cook it like a (microwavable) popcorn, it pops and crackles when opened, hot and crunchy (taste is ok) … I have not seen anywhere else producing such ..
MP…when your hubby invites his new colleagues over for a soiree, make some BEER STICKS….savoury bread sticks and before baking them, brush with lobster oil infused with garlic. In a pot, heat some lobster oil (depending on the quantity of your bread sticks), then saute garlic until soft but not browned. Let that cool and brush the sticks with it before baking. For the dough of the bread sticks, I add crushed fennel seeds, touch of cayenne, ground pepper, seasoned garlic salt, beer and yeast and a touch of sugar. I often am too lazy just to go in town and just buy fennel seeds when I am out of it. So, often I use the MOntreal steak spice or Chicken spice which I always have on hand. I made this up when we were up NOrth when I wanted something to serve with hubby’s buddies. The bread sticks (grissini) at stores are just so plain and big BLAH in taste. I must warn you though that if you want some for yourself, best to set aside yours first before you serve them and once you turn your back, it will be GONE! I made 3 batches (each batch yielding 96 dangkal long sticks) . I am currently making my second batch. This one I will brush the sticks with bacon-garlic infused oil!!!! The third batch will I think I will just make when I visit my nephews in the East. That one, I will brush with garlic infused lobster oil! Last time my friend visited me in Manila she brought bags of Chichiritos which I though were good. Will ask for Zubuchon chicharon next time hehe. chicharon at its best here in Pampanga! my Mom makes chicharon also. when there’s occasion here in our house, people always ask for her homemade chicharon. simply the best! hope to taste Zubuchon soon! Hi marketman. It’s a good topic that you’ve shared. Can you please advise what is the best type of pork skin to be used in chicahron business, maybe the cheapest type. We started chicharon business 2 years ago but was stopped early this year because of mismanagement, and now I’d like to start again. Any advised will be helpful. Thanks in advance. eve, yes, I completely agree, different strokes for different folks. Our own cooks were trained under the “Carcar” method and practiced extensively. We cook our chicharon in cast iron vats in smaller portions than most manufacturers in Carcar. And we use the same pork skins, which are imported from Europe or North America. We cook our chicharon in pure lard, not vegetable oil like many other chicharon places in Manila (they use lard in Carcar too) but the main difference is that we do not add any MSG, or any products that include MSG in their flavoring make-up. That’s the main difference. MSG, vetsin, ajinomoto, aji-flavoring, etc. are the prevalent ingredients for many mass produced chicharons. And we sell our product within 48 hours of making it in most cases and put a VERY short expiry date on our product, unless others that put 2-3 month expiry dates to make them last longer on grocery shelves. Here’s a link to a visit to a wonderful chicharon maker in Carcar, as well as the start of the multi-post chicharon chronicles I wrote. hi meron po ba silang online shop sa facebook? What’s in Your Favorite Fried Lumpia?